Semi-finished paste product used to prepare cold and warm base mixes for homemade GIANDUIA-flavoured-ice-creams (chocolate and hazelnut) and cold desserts. 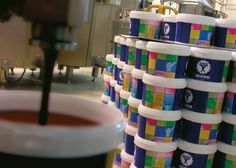 Semi-finished paste product used to prepare cold and warm base mixes for homemade CHOCOLATE and HAZELNUT-flavoured ice-creams and cold desserts with pieces of toasted hazelnuts. Dressing particularly full-bodied, intense and full-bodied, specific for sweets. A base of pure chocolate with drops of rum which intensifies the flavor. Not just a final decoration, but a real ingredient that adds taste and flavor to ice creams, desserts, puddings and cakes.